De Troch is nearing its 200th year of brewing. Despite this milestone, the brewery is virtually unknown in the United States. Their products have only been imported sporadically and those have mostly been the very sweet fruit beers under the Chapeau name. According to Jef Van den Steen’s book “Geuze & Kriek,” The De Troch family has been a mainstay of the Wambeek community for nearly two centuries as “gentleman farmers,” brewers, and even as head of city hall. In fact, their family won election of the mayor’s office from 1885 -1976 except for one 6 year term. In that election, Louis De Troch lost the 1933 election by 15 votes to a competitive brewer. Their reign ended when the small village of Wambeek was included in the municipality of Ternat for administrative purposes/conveniences in 1976. Currently, the brewery is owned by the Raes family who married into the De Troch family. When the last De Troch died without a child, his sister and her husband (a Raes) took over the brewery in 1940. 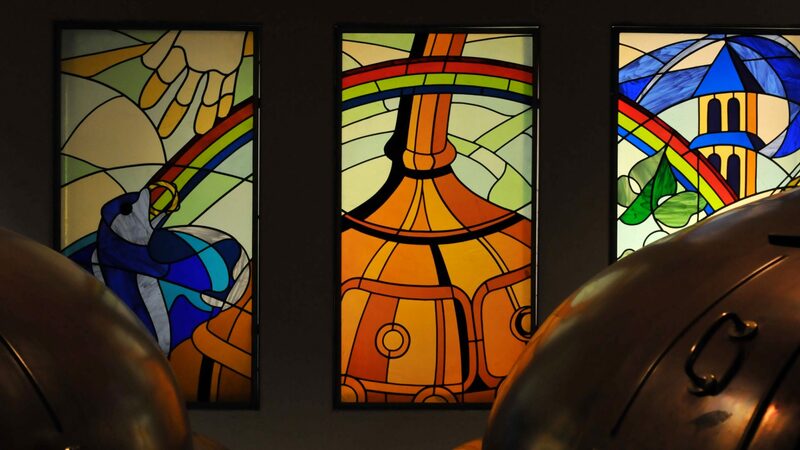 The Raes family stewarded the brewery through a steep decline in the popularity of Belgian styles, including Lambics by getting creative. In the mid 80’s, Jos Raes introduced what was believed to be Belgium’s first “exotic” beer to Belgian drinkers – De Troch Banana. To appeal to the French and French speaking market, they started selling under the Chapeau name in 1991. From then on, they created many sweeter fruit Lambics to keep the brewery going. They still made their De Troch Kriek with real sour cherries though. The De Troch-Raes family and their brewery are survivors and after 7 generations of family ownership, are now seeing a resurgence in interest in traditional Geuzue/Gueuze and Kriek. The De Troch Brewery is now bringing out more of their Oude Geuze (known as Chapeau Cuvée Lambic Geuzue in Belgium) and their Oude Kriek. The Oude Kriek hasn’t reached US shores yet, but is on the near horizon. Of course, I’ll be writing about that one as soon as I can get my hands on it. Appearance: Hazy gold, beige head, ok retention. Aroma: Lemon, light funk, tropical fruit, touch of barnyard, blood orange, lime. Taste: Tart, lemony, lime, blood Orange, touches of funk and barnyard. Overall Impression: This is a very nice offering from De Troch. It’s light, refreshing, and more on the fruity/citrusy end of the spectrum. It’s not the most complex of Oude Geuzes, but it’s very tasty, enjoyable, and balanced. It’s a bit lighter in body with a more approachable ABV compared to some other Oude Gueuzes/Geuzes making it a nice summer drinking beer or that refreshing interlude when you’re looking for something bright and inviting. At about $7.50 a 375ml (depending on your location), this also makes for a more price friendly beer. It’s ideal for those looking to get into the style or for anyone who just wants a nice, tasty Geuze. You get a little bit of the funk that makes this style of blended Lambic great but not too much to scare off the novice. Availability: Nationally in better beer stores. It’s new to the US so request it from your retailer as distribution is growing. Imported by Wetten Importers.